Have you ever read the ingredients label on Ranch dressing. Eek! Nasty and no thank you. Honestly, making your own is really not that hard. The hardest part is cleaning the blender/food processor when your done. 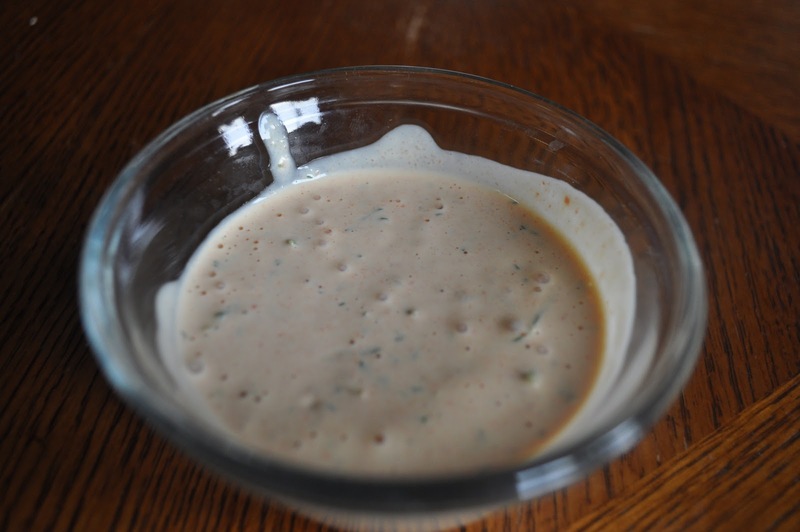 But homemade Ranch dressing tastes so good, it’s worth it. Psst, it’s cheaper too! ETA: To make clean up a breeze, simply use a wide mouth mason jar and an immersion blender. Place everything in the blender/food processor except the olive oil. Whirl around until very well blended. While the blender is still on, slowly drizzle the olive oil in a thin stream. The oil will emulsify it to a yummy creation. Another ETA: I made this recently and added a roasted red pepper. Delicious! It gave the dressing a nice red tinge. Or add 1-2 tsp chipotle chili powder for a Southwestern kick. Could I use dry dill and parsley ? wow, she cooks AND is gorgeous. what a rare beauty!